Looking for a dessert for Easter Sunday? Since today’s theme is being helpful, I thought I would throw this Fruit and Nut Trifle out there. You will want to eat the whole bowl. The. Whole. Bowl. Do it. Preheat oven to 350 degrees. In a bowl toss the nuts with cinamon then water and sugar and then spread on a sheet pan and bake for 5 minutes and toast for about 7 minutes. Chop dried fruit and cover with hot water and a little rum and let set for 10 minutes. Drain the fruit and add to the nuts. Toss. In a saute pan heat the butter and add a little sugar. Add the diced pears and saute and then add the fruits and nuts. In a bowl mix the heavy cream with the confectioners sugar vanilla and rum. Mix until cream is whipped to soft peaks. Brush the cake with the orange juice to make it a little moist. In a trifle bowl first add some whipped cream and then place the sponge cake on top to cover the cream. Layer with the fruit/nut mixture and then add a little cream. Follow with the cake and continue to build the trifle. Finish with the whipped cream. For a festive look top with fresh raspberries. Refrigerate at least 6 hours or overnight. Preheat the oven to 350 degrees. Butter a large square pan (13″x18″) and line with parchment paper. Put the eggs into a mixer (Kitchenaid or handheld). Slowly add the sugar to the eggs, beating until they are twice the volume from when they started and a pale lemon color. Slowly add the flour to the above ingredients and also the lemon zest. Pour the mixture into the pan and bake for 15 minutes. After it’s done, you can brush the cake with some orange juice, using a pastry brush. 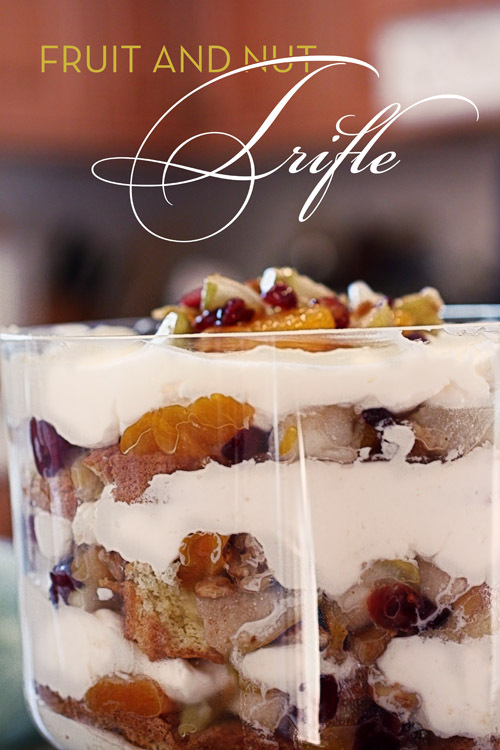 This makes it nice and juicy, and adds a complementing flavor for the fruit and nuts in the trifle. Try not to eat it all. Or eat it all. Whichever.